Steamroller printing at Arts Day. Wilson College will host its annual Arts Day - an educational and fun-filled day of free events that encourages everyone to appreciate and celebrate interdisciplinary arts - on Wednesday, Oct. 10. The day-long event, which is held at locations all over the campus, is free and open to the public. One of the highlights this year is the return of steamroller printmaking, where a paving roller is used to make prints from giant woodcuts - blocks of wood in which cuts are made so the lines to be printed stand out in relief. 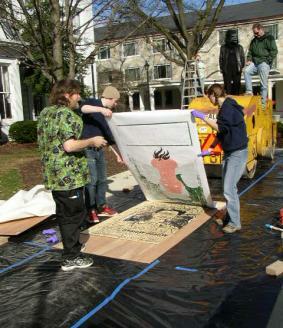 Steamroller printmaking will be held from 9 a.m. to noon in front of Lenfest Commons. Arts Day includes all-day events and scheduled events, including art exhibitions, pottery demonstrations, a film, vocal and dance performances, social justice display, poetry and other book readings, making a handsewn book, equestrian performances and more. A complete schedule of events is available at https://wilson.edu/wilson-college-arts-day-2018. The Wilson community established Arts Day to celebrate the visual and performing arts and provide an opportunity for everyone to take note of the impact of the arts on our daily lives.